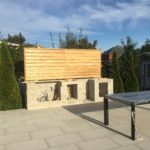 Design & Build Process - Pro-Land Landscape Construction Inc.
Whatever your property size or style our team will work with you to create the landscape of your dreams. From the first point of contact we want your experience working with us to be exceptional. Starting with the initial design, right through construction our team will work to exceed your expectations. An on-site meeting is scheduled to discuss the project, and your general wish list. We will review your property as needed to assess the scope or work. We review our portfolio with you, displaying the scope of our work and what the design process includes. Following the initial meeting, you will receive a quote for our landscape design services. Each design begins with a base plan, for this we require a property survey to draft property lines, buildings and any other existing features. Site visits will take place to confirm all measurements and take site grades. 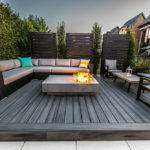 Once this is completed, a second meeting is scheduled with a landscape designer to discuss the wants and needs for your landscape, your style, general layout, smaller details, and rough budget. Soon after, you can expect a preliminary drawing to be sent for your review. The design step is on-going and varies for each client. We will review and discuss the initial concepts based on your feedback and our expertise, revising to improve upon the design until you are satisfied. During this process we will also review materials and plants for the landscape. The design has been confirmed and materials have been reviewed by you. An itemized construction estimate, a final package of all drawings, and a proposed pay schedule for construction are provided to you. Many new clients come to us with drawings completed by other designers and this is where their process with Pro-Land would begin. We can provide you with an estimate based on your drawings, making suggestions where we believe there is room for improvement, and manage your project moving forward. 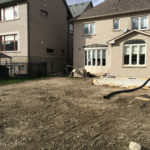 The design phase is complete, and an estimate has been provided, you will now be presented with a landscape contract to reserve your spot in our construction schedule. A 30% deposit is made upon signing, and progress payments are continued throughout construction. Our skilled management and construction team will be introduced to the project to begin construction planning, scheduling and material ordering. You will be introduced to some of our key team members that will manage the construction process. Upon completion of the project, a final walk through with you and our construction management team is done to guarantee that you are satisfied with the finished project. During the design process, we complete a set of detailed drawings to ensure that any future construction will run smoothly. 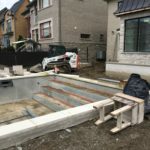 You will be provided with a hardscape drawing, complete with a list of selected materials, a planting plan, and a set of construction details showing how elements of your project will be built. Additionally, you are given the option to add a colored master plan and/or 3-D renderings. For this reason, design fees will vary based off the size and complexity of each design.